If you run a contract cleaning business, meet your new favorite website! The Maintex Cleaning Academy is an industry-leading online training toolkit. It's powerful, easy-to-use, and completely free. Simplify your training process and make employee on-boarding, continuing education, and regulatory compliance nearly effortless. Several more lessons are in the works. Every lesson includes safety information such as proper PPE and chemical use guidelines. SDS sheets for all Maintex chemicals are available through our online store. Lessons, certification tests, and training guides are available in both English and Spanish. Visite el sitio en español. Connect directly to the Maintex Online Store for easy re-stocking of the chemicals and products your need. 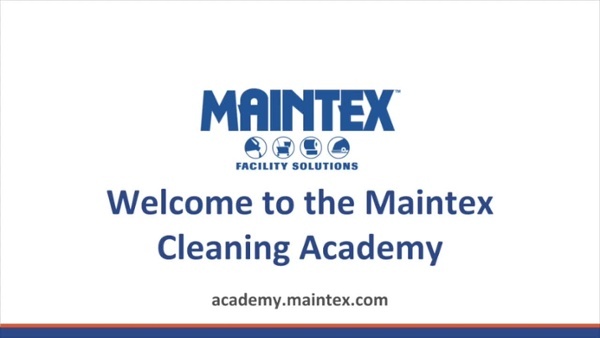 Your Maintex sales consultant can help you implement an easy-to-administer ongoing training program for staff or contractors using the Cleaning Academy.